P-M Heden of The World at Night took this photo of the aurora borealis from Lapland, northern Sweden in March 2012. 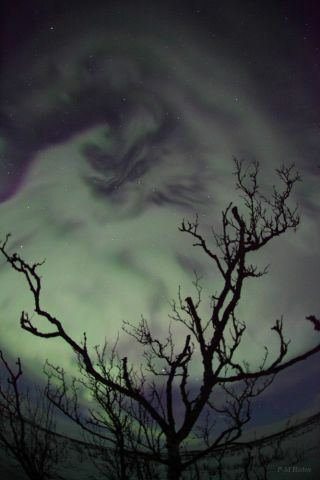 A hauntingly beautiful aurora borealis appears in this night sky photo. Veteran astrophotographer P-M Heden of The World at Night captured this image from Lapland, northern Sweden in March 2012. Charged particles from the sun’s solar wind blast through Earth’s atmosphere and cause the auroras. These particles, at altitudes above 50 miles or 80 km, interact with gases in our atmosphere causing the varied colors in an aurora. Due to the Earth’s magnetic field, these particles travel to the Earth’s pole causing the aurora borealis, or northern lights , and its southern counterpart the aurora australis, or southern lights.